When should you drive in a lane under a lane signal showing a red X? If there is no visible oncoming traffic. If you are passing the car in front of you. Lane use control signals are used when the direction of the flow of traffic in a specific lane changes throughout the day. They are used to show which lanes of traffic are open and closed, as well as to show if toll booths are open or closed. Drivers should never drive in a lane underneath a red X. 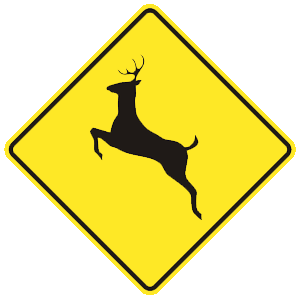 This sign warns that deer cross the roadway in the area. You should slow down, be alert, and be ready to stop. Drive faster than surrounding traffic. Drive at the maximum posted speed limit. Drive closely behind the vehicle in front of you. When heavy rain reduces visibility, reduce your speed. Turn on your headlights so other drivers can see your vehicle. If the rain is so heavy that you are unable to see clearly, drive onto the shoulder and stop until the rain lets up. Move your vehicle off the traveled portion of the roadway, if possible. Not move your vehicle under any circumstances. Wait until the police arrive before moving your vehicle. After a minor collision, move your vehicle off the traveled portion of the roadway, if possible. Do not leave the scene of an accident without identifying yourself and rendering assistance. What may help drivers conserve gasoline? Sitting in their driveways with their cars running. Every time you have to stop quickly, it takes time and fuel to accelerate and get your vehicle back up to the speed of traffic. Drivers who look far ahead of their vehicles can slow down gradually or change lanes to avoid unnecessary braking, leading to better gas mileage. Is a very safe driver. Should not let following cars pass. May create a dangerous driving environment. Driving more slowly than the flow of traffic can be hazardous. If you are on a two-lane, two-way road and driving so slowly that traffic is backing up behind you, you are required to pull off the road and let the other vehicles pass. Only drive significantly under the speed limit when conditions require it. Drive until you think the water is too deep. Drive through, as it is unlikely the standing water will become too deep. Turn around and find another way to go. Walk out into the water to determine its depth. If you come to a roadway that is flooded, turn around and find another way to go. Do not attempt to drive through the water. It is impossible to determine the depth or current of standing water and your vehicle could become submerged or swept away.